Bali may be small, but what it lacks in size it more than makes up for in personality. Each area of this little island has its own charm. Perhaps you are looking for a relaxing area with little noise and a slower pace, then Amed is the place for you. A cultural buff with designs on visiting museums and art markets? Try Ubud, Indonesia’s artistic center. Or maybe you would like the best of both worlds – you will love Sunar. 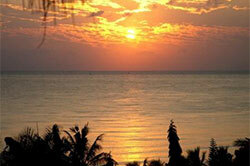 We have found the best Bali resorts and will help you decide which is the perfect one for you. Note: More hotel descriptions available on the non-mobile version of our website. Situated in the cultural heart of Bali, Ubud hotels and cottages reflect the art and architecture of the area and are close to the shopping, museums, and other attractions. There are many spas with incredible offerings and the jungle and rice paddies make for great touring expeditions. There is a traditional art market with locally made goods that make great souvenirs of your Bali vacation. From humble beginnings, Honeymoon Guesthouse has grown into a charming small hotel. It was named after their bakery, which is still in operation on-site. 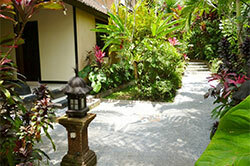 Villa Sarna is a hidden treasure deep in the Ubud area of Bali. Located in the forest and surrounded by lush paddy fields, Villa Sarna offers tranquility, a soothing spa, and overall relaxation. 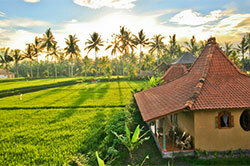 Dragonfly Village is located close to the center of Ubud and offers stunning views in every direction. Situated in the midst of one of the most beautifyl rice fields in the Ubud area and offers a magnificent panorama of the sacred Mt Agung. Amed is known for its beaches, snorkeling, and diving. It is laid-back and makes for a great getaway from the hustle and bustle of some other zones. There is a sunken ship off shore that allows for some great underwater exploration, and the hotels in Bali’s Amed will give you a real feel of the authenticity of how things used to be here. The Di Abian Resort Amed is a quiet and traditional Balinese garden hotel situated in the middle of the newly popular and relatively remote northeast corner of Bali..
Om Shanti is located in the coastal village of Amed and lies along a beautiful coastline with gentle bays for snorkling and swimming. Overlooking the ocean, each room offers ocean views, lush tropical gardens and private swimming pool. 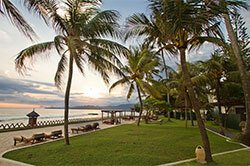 Sanur is an upscale section of Bali, and the villas located here will reflect that image. There is a relaxing atmosphere, and the beachfront accommodations are luxurious and open, giving you a feel of being part of the outdoors rather than closed off from them. Sanur is the perfect mix of relaxing and stimulating, with plenty to do yet a laid-back persona all around. Visit a museum or take a walk along the beach or partake in spa offerings. Kejora means “The Morning Star” and can this property can indubitably live up to its name. 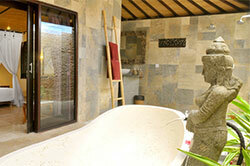 Facing the stunning Sanur Beach, Villa Kejora has an open-air layout, is spacious and pristine. Located along the coastline, Candidasa is a relaxed area of Bali with many visitors coming to enjoy the numerous yoga retreats and ashrams. High tide brings the ocean right up to your accommodations covering the glittering black sand beaches. Sunset over the ocean is a sight not to be missed. This beautiful resort and spa offers peace and relaxation and is located right alongside the ocean. Each villa offers a private balcony with views of the ocean, pool or lush flower gardens. 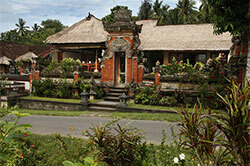 Manggis is a traditional village in the Candidasa area, and is in the easternmost district of Karangasem. Puri Bagus Manggis is located directly in the center of the traditional village of Manggis, the easternmost district of Karangasem. The pace in this private, peaceful center is slow and relaxing.